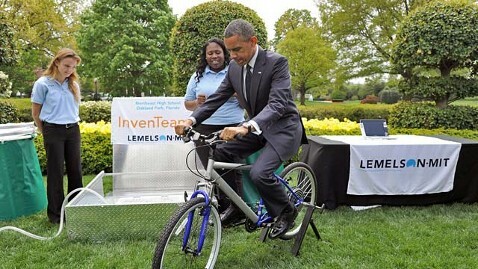 WASHINGTON (Reuters) - President Barack Obama hopped on a mountain bike that was mounted on blocks and pedaled away, taking part in a science experiment on how to filter unsafe drinking water during an emergency. The invention was the brainchild of Kiona Elliott, 18, and Payton Kaar, 16, two participants in the White House Science Fair, which Obama considers one of his favorite events of the year. Struck by the devastation after Haiti's 2010 earthquake, Elliot and Kaar, from Oakland Park, Florida, came up with the collapsible pump system, winning a grant from the Massachusetts Institute of Technology, and scholarships from the Gates Foundation. "This is outstanding!" Obama told the beaming inventors, part of a group of about 100 students from across the country who set up their inventions at the White House Science Fair on Monday. The fair stood in sharp contrast to events of the past week. As Obama toured the exhibits, listening to well-rehearsed explanation about inventions that could improve the world, the Justice Department formally charged another young man, 19-year-old Dzhokhar Tsarnaev, for helping to create bombs that killed and injured people at the finish line of the Boston marathon a week earlier. Shortly after Obama left the science fair, he observed a moment of silence for victims of the Boston bombing, in private. At the science fair, Obama told students he was proud of them, listened to their earnest speeches, and asked questions about what they planned to do next. He praised Sara Volz for breeding new types of algae, stored in her bedroom. "You have very supportive parents," Obama quipped. Obama encouraged 10-year-old Evan Jackson as well as Alec Jackson and Caleb Robinson, both 8, to keep pursuing science. The boys came up with a cooling system for football equipment, and sensors that help detect overheating. And he lauded Jack Andraka, a high school student, who invented a faster, cheaper way to detect pancreatic cancer. "Young people like these have to make you hopeful about the future of our country," Obama said. "We've got to do everything we can to make sure that we are giving these young people opportunity to pursue their studies and discover new ways of doing things."